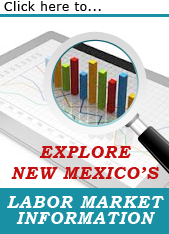 The New Mexico Workforce Connection Centers are located in 21 communities statewide. The friendly staff in each center assist businesses with posting their job openings on www.jobs.state.nm.us, special recruitment, analyzing hard to fill jobs, layoffs, job fairs, and skills assessments for hiring. For job seekers, staff assist with job search, job referrals and placement, and customized skill development like interviewing skills and resume writing.